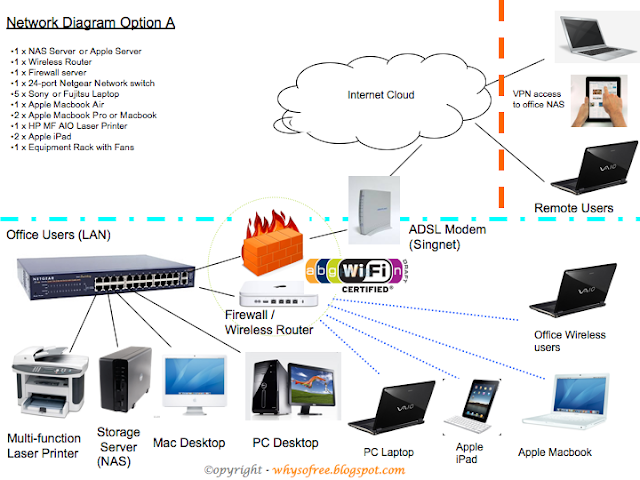 Mac, PC & Apple (萍果电脑) iPad Network Diagram | Why You So Free Lately ? Ever wondered how an office (SOHO) with Mac(萍果电脑), PC (ソニー株式会社) & Apple (アップル) iPad looks like? This simple network diagram illustrates a Mac Mini Server configured as a secure file server, Wiki Server & a Spotlight Server interworking with windows machines (PC), Macs & portable devices / tablets like iPads. Great diagram! I used a website called Lucidchart to create a free network diagram and it was really easy to understand. If you use diagrams often you should check it out!